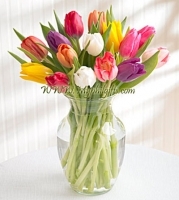 Vibrant fresh cut tulips will make a cheery showing wherever they are displayed. We have selected 12 stems in a variety of mixed colors. This bouquet is perfect for any occasion. Flower colors will vary to fit the season and ensure the freshest blooms are delivered. You can choose to include a glass vase with the bouquet.